I'm a bit out of sequence here, but I will go back and add in a couple of walks soon including Frenchmans Cap and Chalice Lake/Cathedral Mountain. Meanwhile, on a sometimes rainy Saturday, I went to Grey Mountain. This walk commences from Van Morey Road, Margate, (see map here) and offers views of the Huon and the mountains beyond. On the strength of this, it makes it into Walk the Huon, and I've updated the walk description there. The track and mountain are within what is now known as Snug Tiers Nature Recreation Area. This appears to be a sort of reserve in which 4WD vehicles and motorcycles are allowed, but the area is protected from some things, such as the taking of firewood not being allowed. If you do this walk, you will share the tracks with 4WDs and bikes, but these are all subject to the road rules and must be registered and drivers/riders licensed. My experience yesterday tells me the rule about registration is not adhered to, but the vehicles that were there were being used sensibly. There is one well-burnt car body along the route. The top of Grey Mountain has a trig point and a couple of communications towers. Views normally include various close and distant peaks, but there was little to view yesterday. I had a view down to the river, Castle Forbes Bay I think, and an occasional glimpse of Collins Bonnet through the rain to the north. The walk traverses easy 4WD tracks and overall rises maybe 500m with some ups and downs. Much of the walk is across the undulating Snug Tiers with steeper climbs at the start and finish. I suspect that Spring would be a good season, with the flowers out, and a rainy autumn day was less than ideal. Nevertheless, the summit is only 831m, so on a rainy and windy day it's probably a better bet than some other places. 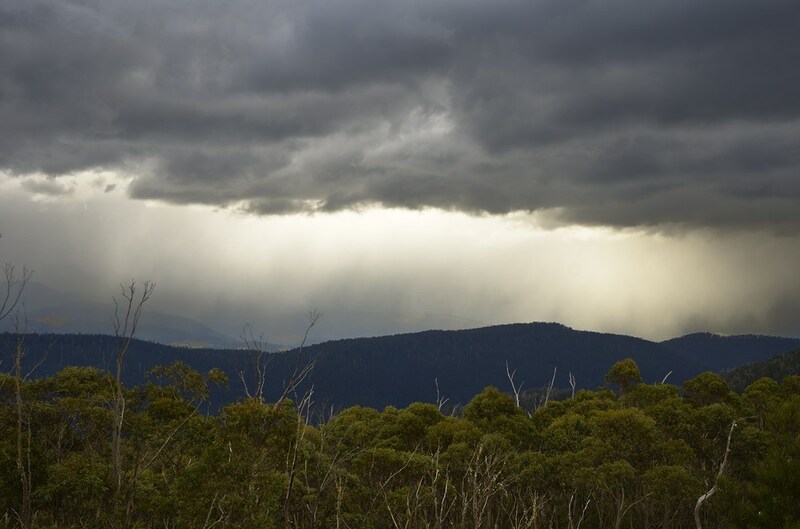 In any case, it makes for a different view of the Huon area than those usually acquired. The walk overall is a little over 20km return, so requires some solid effort. Thanks Susan, that's very interesting. The information I had was that to climb Grey Mt from the Huon side required the crossing of private property. This raised two issues, (i) whether I could walk up there at all, and (ii) whether I could actually promote it to people. If there is a way for the general public to climb Grey Mt from Cradoc, which is open to being promoted, that would be great. I assume from your comment that you have to at least cross property belonging to the abattoir - is that correct? Do you know if there is any other private property higher up? If so, who owns it? It seems to me from the map that there are several individual land parcels crossed by the obvious track. If there is just one land owner, it's conceivable that they might be amenable to the sensitive use of their property, but whether they want random walkers showing up who have read my website is another matter. Then again, maybe there is a right of way across the land too - it could be an official fire trail for example. Thanks. Those button grass plains used to be a reliable spot for Ground Parrots (might well still be; I haven't been there for years).